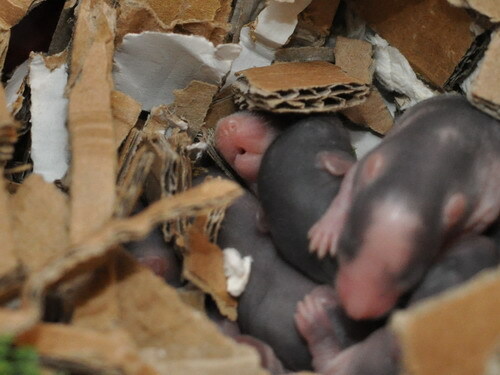 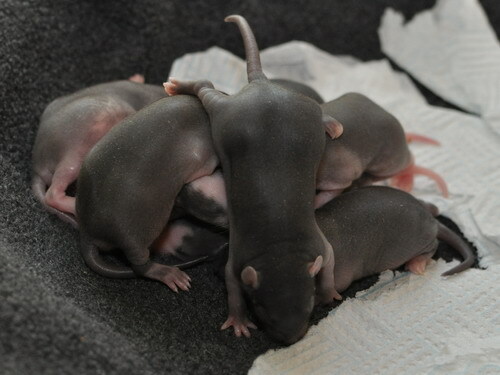 08/08/2013: 8 babies, day 23 of the gestation period (9 born, 8 surviving). 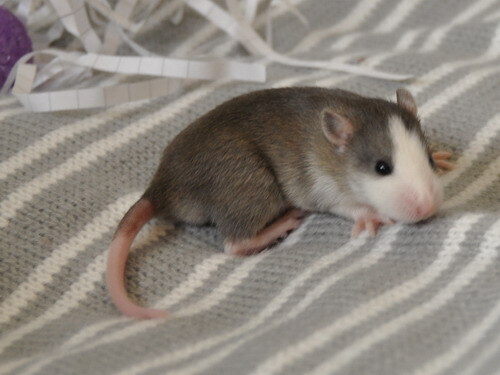 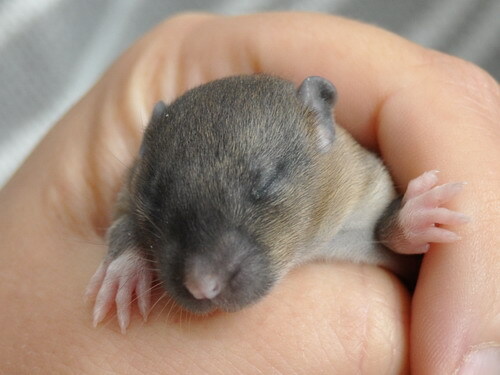 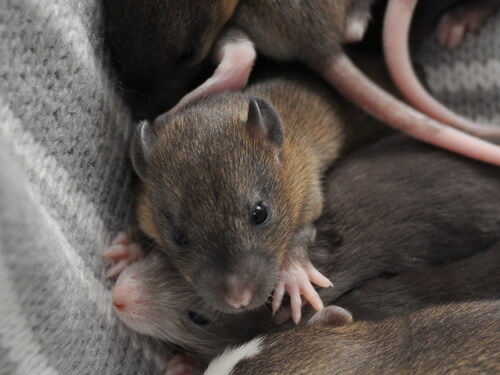 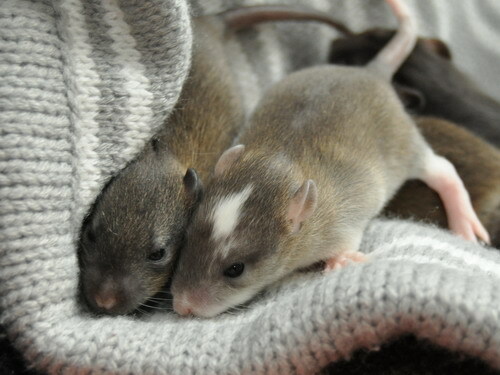 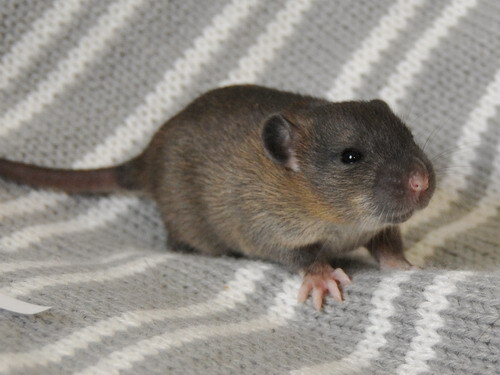 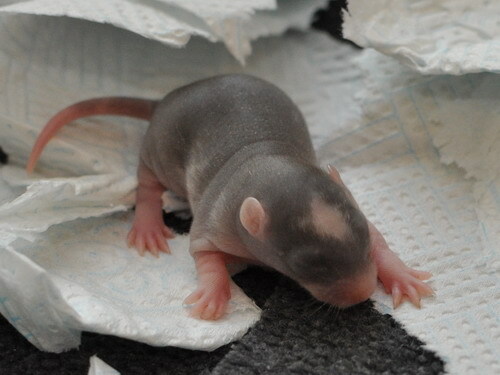 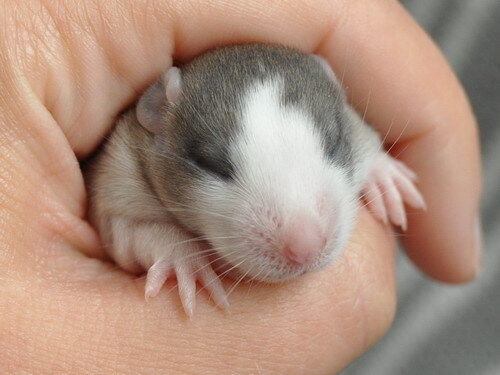 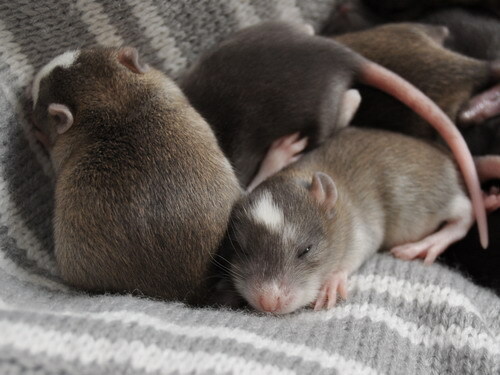 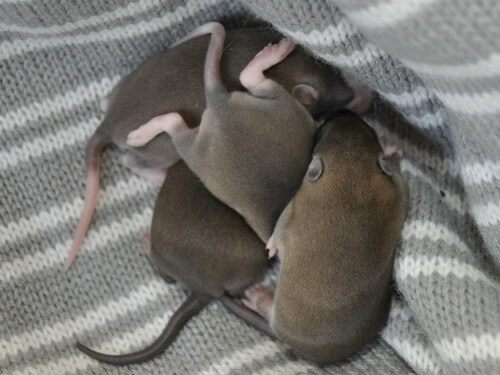 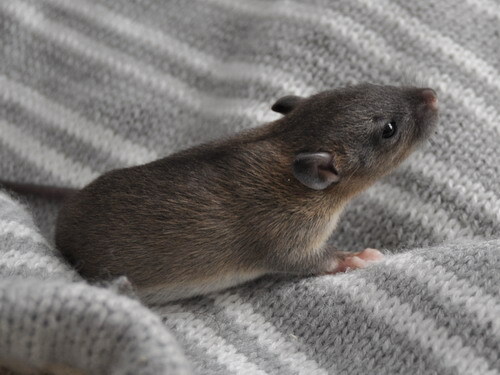 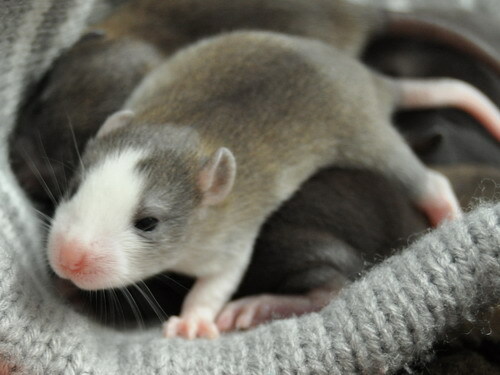 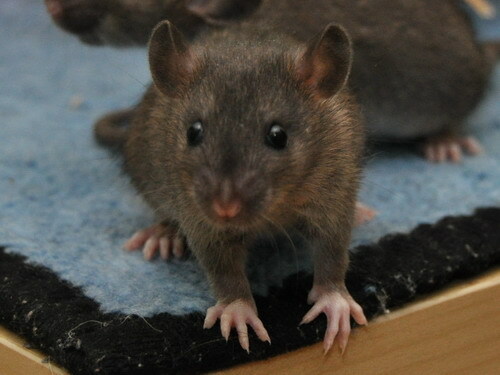 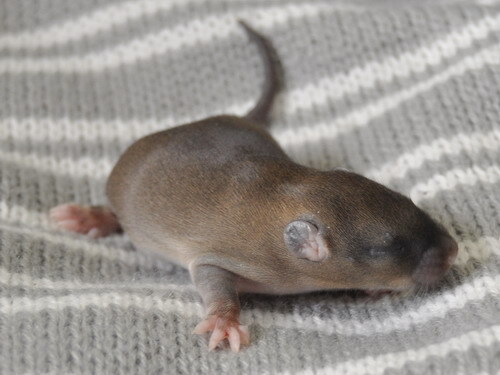 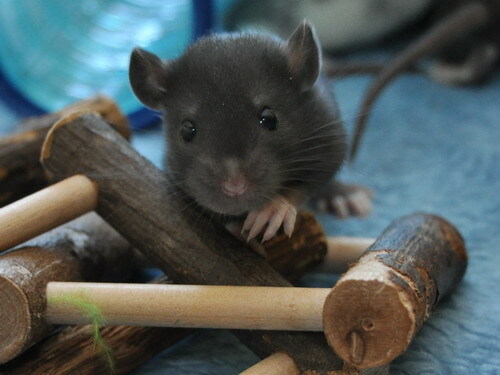 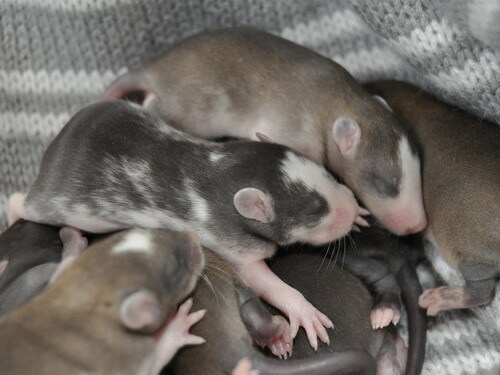 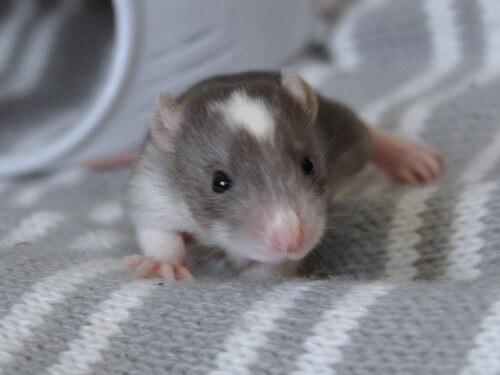 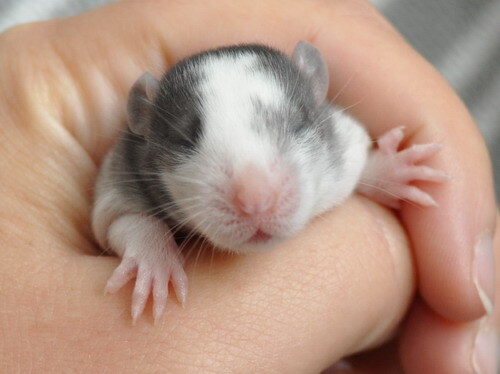 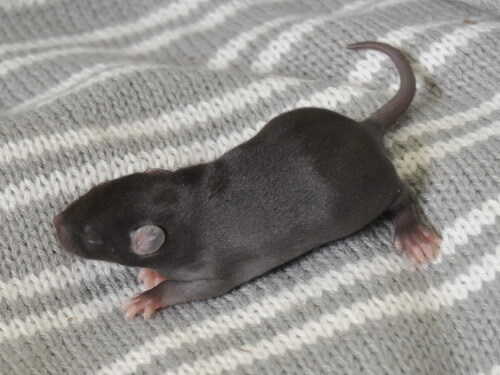 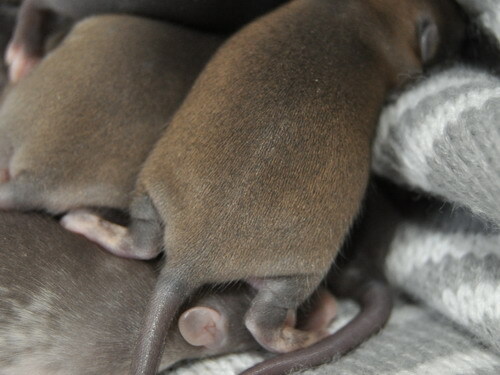 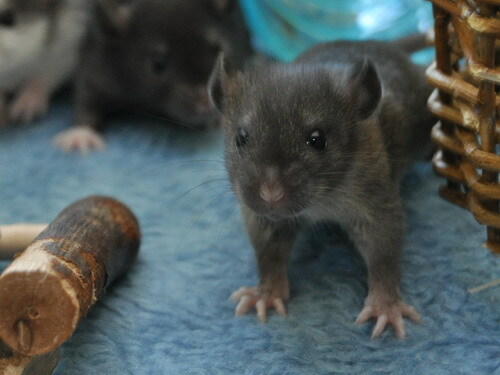 Minifig was one of the cinnamon surprises in Flow's first litter (she also likely carries the red-eye dilute gene, via her dad Brandywine Wellington). 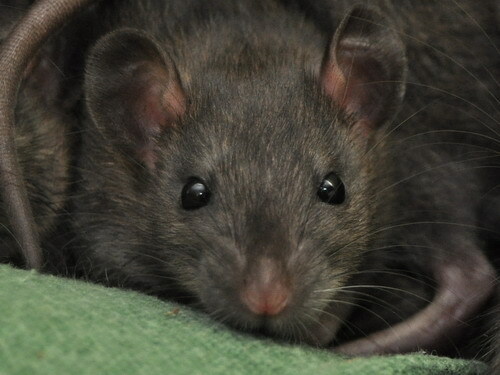 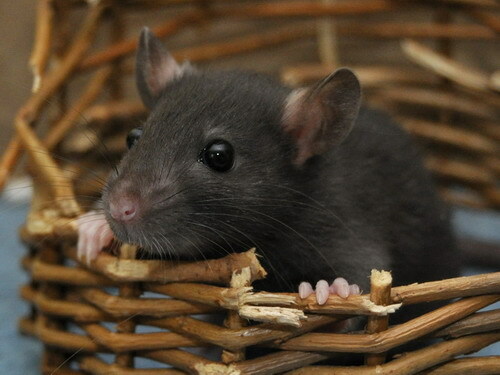 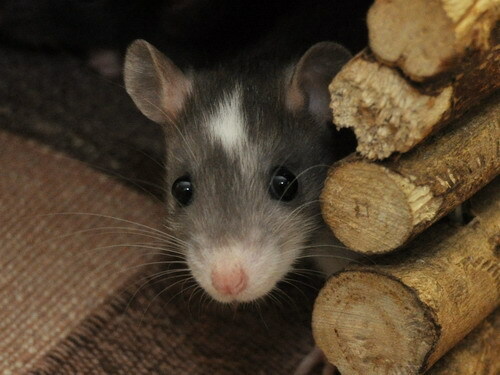 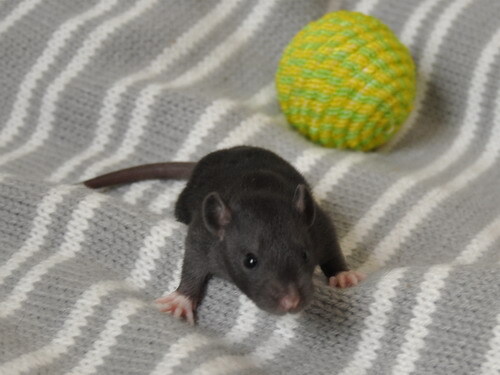 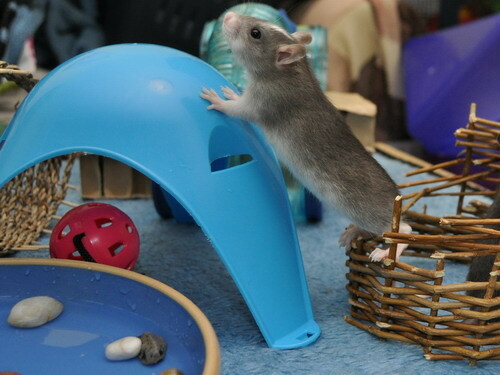 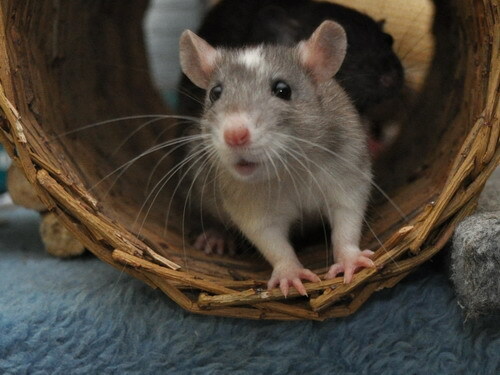 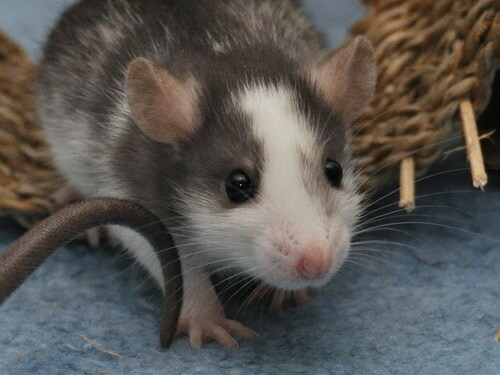 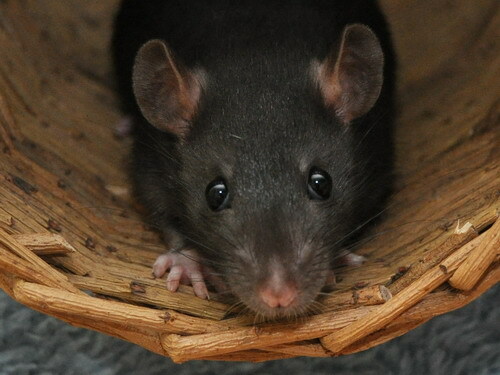 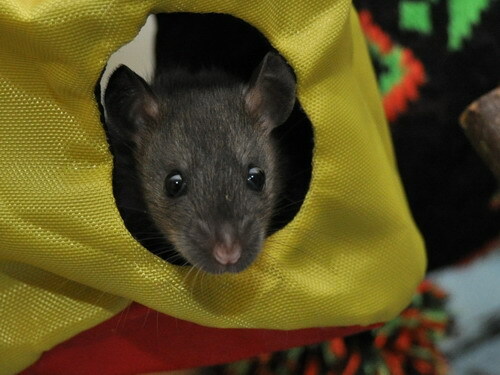 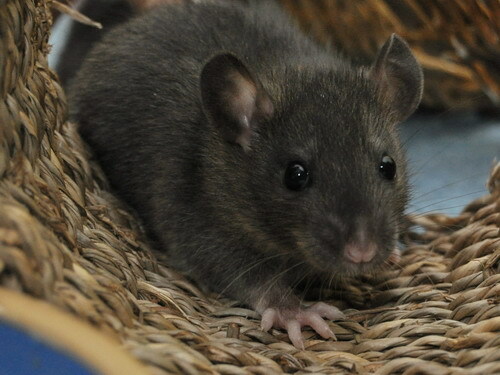 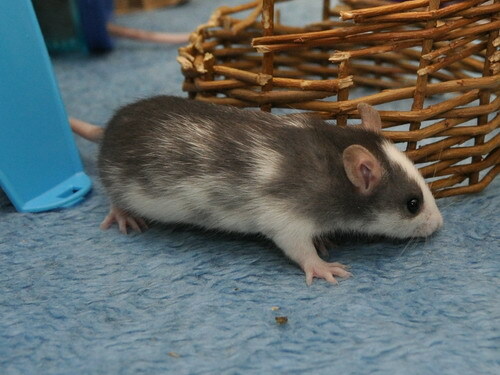 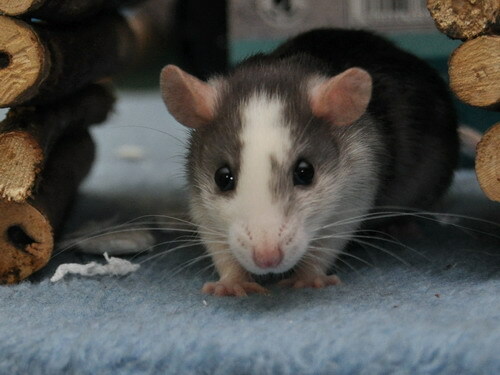 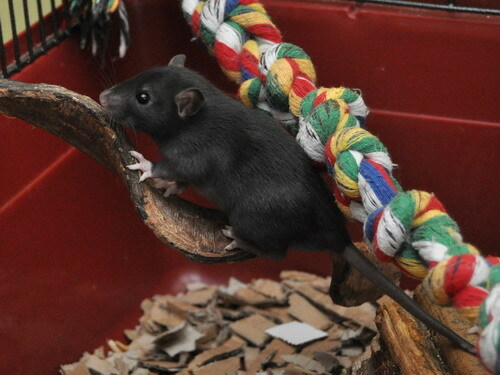 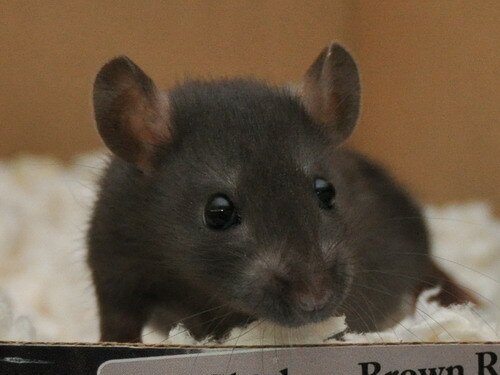 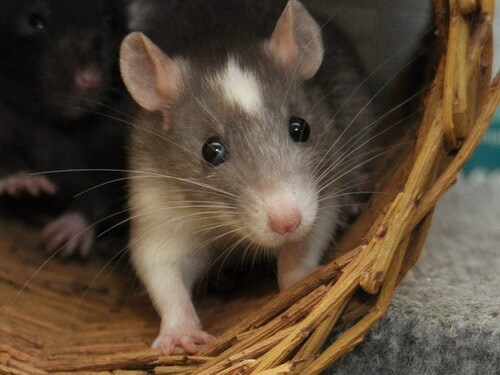 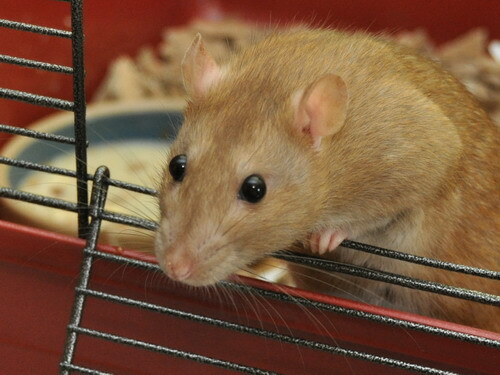 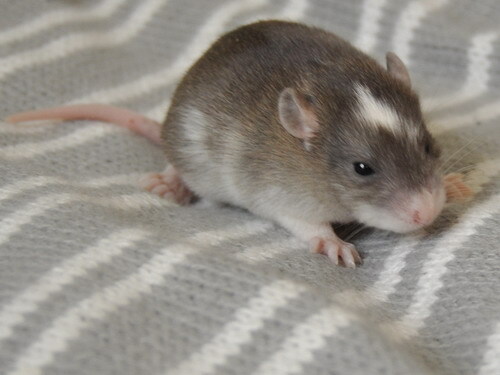 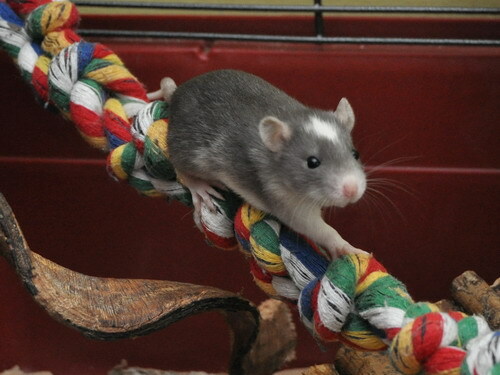 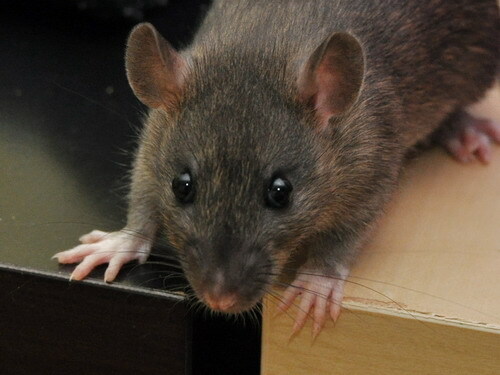 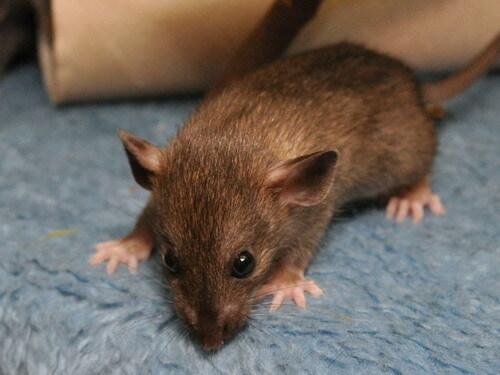 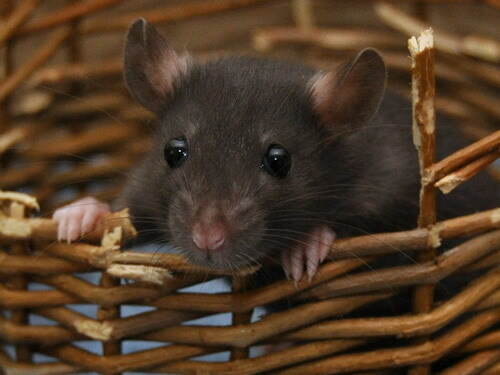 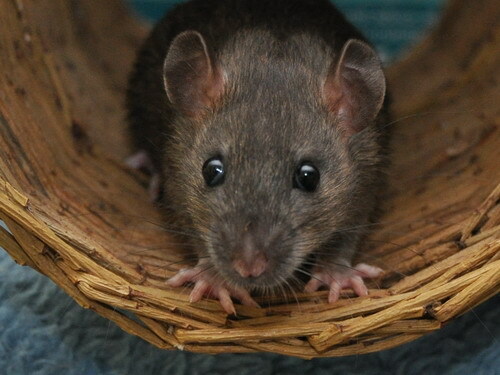 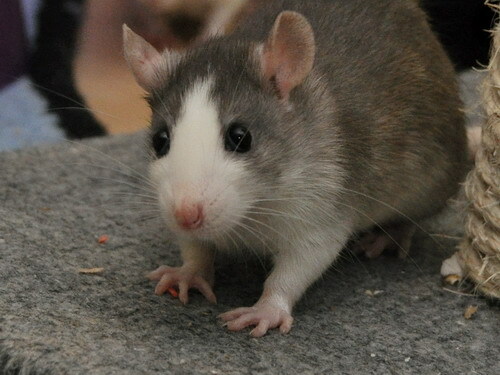 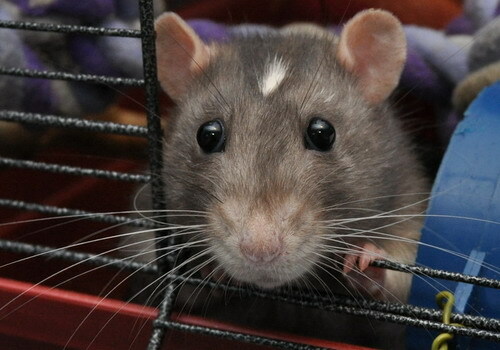 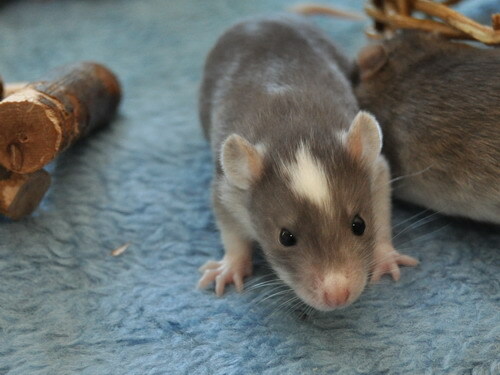 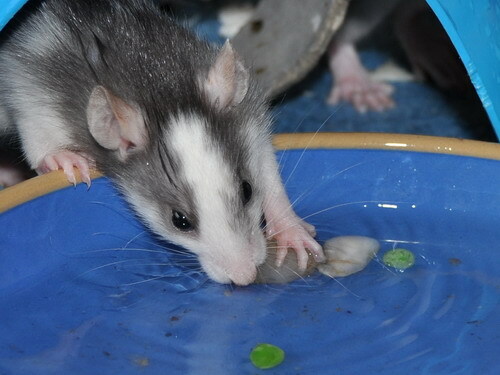 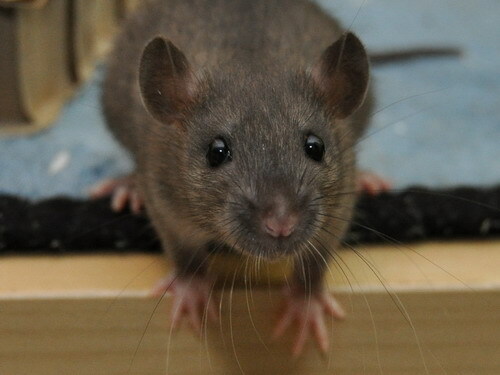 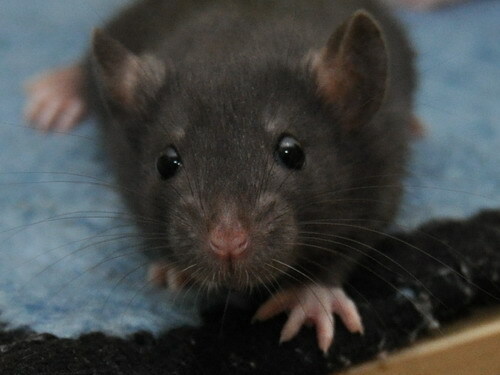 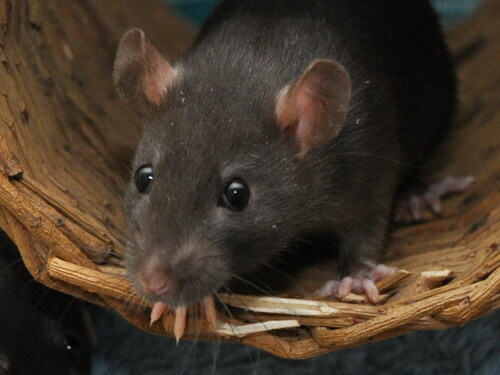 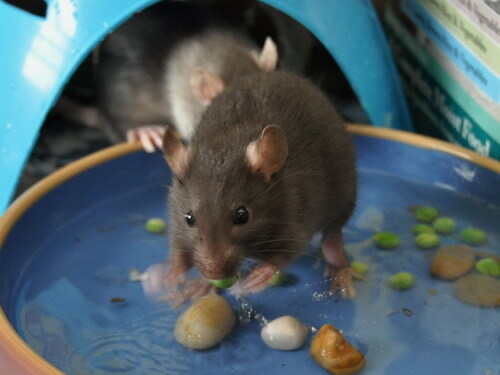 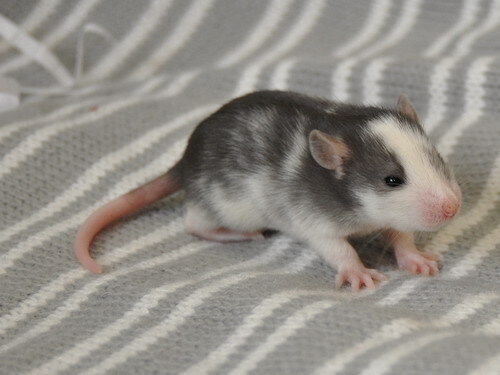 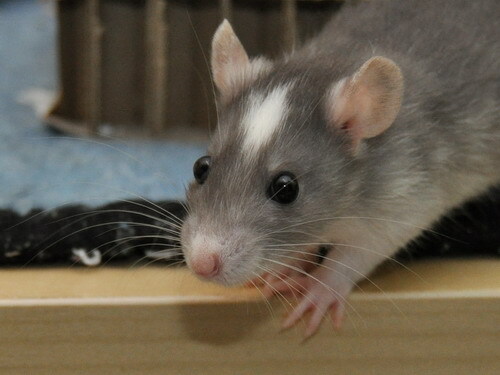 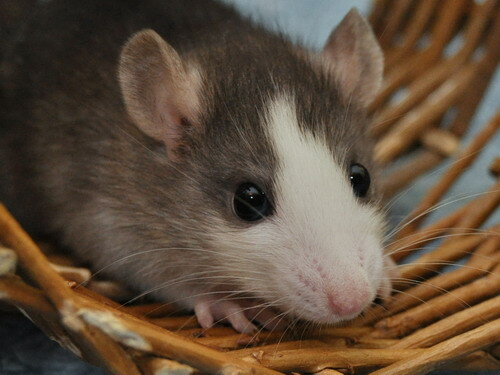 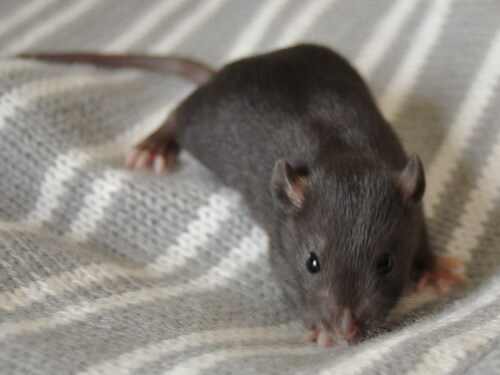 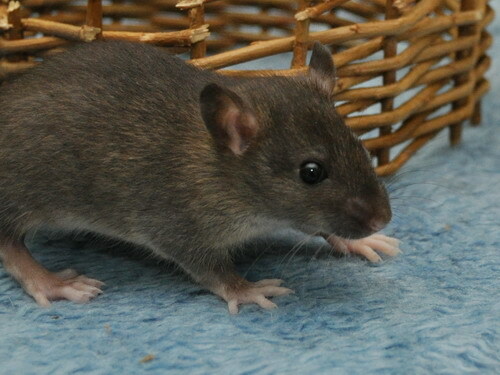 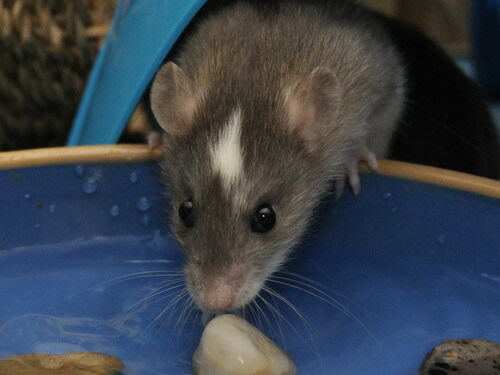 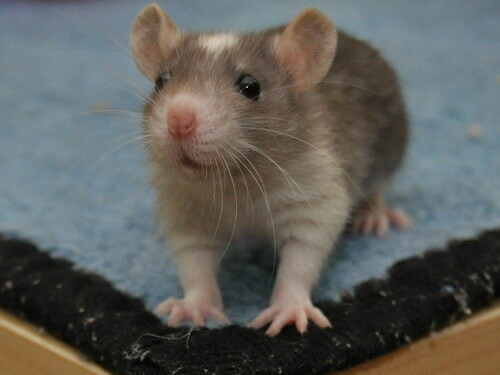 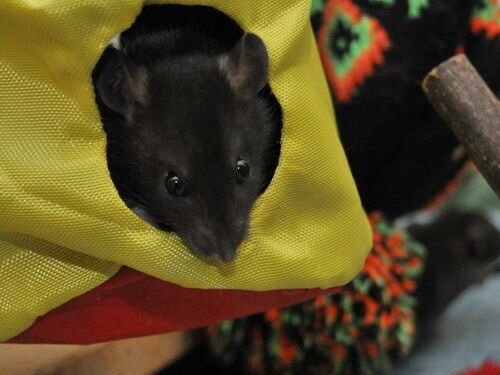 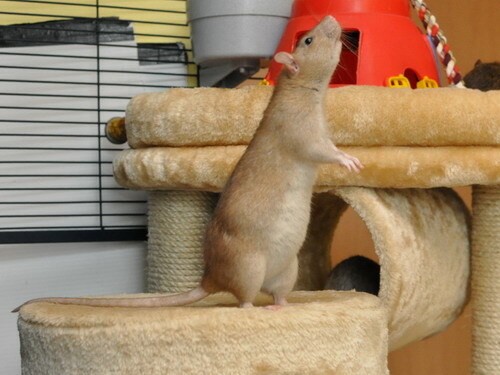 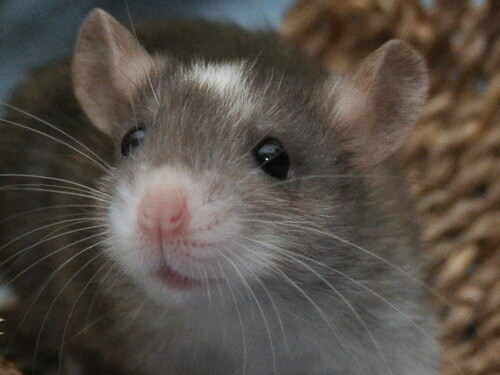 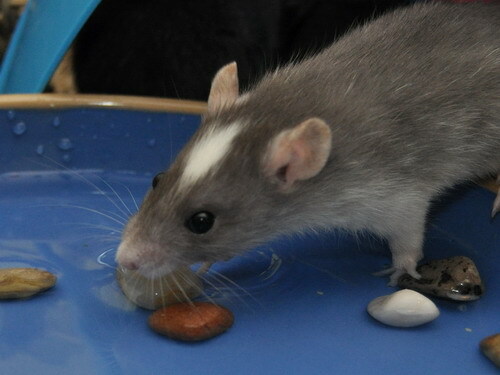 She is one of those rats who has very much grown into her personality as an adult, and is sweet and busy, steady and quiet. 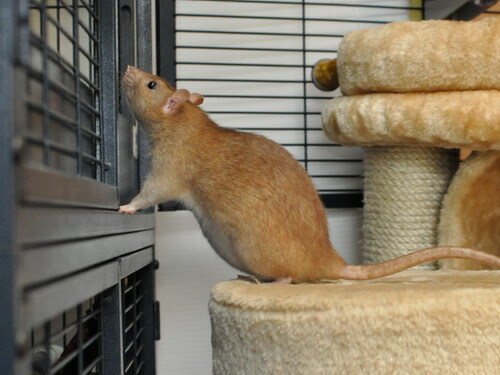 Although independent she likes to check in with me a lot during freerange. 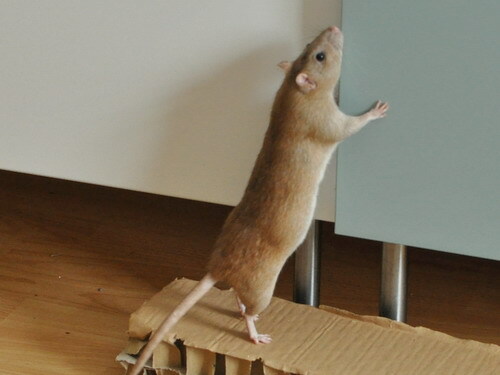 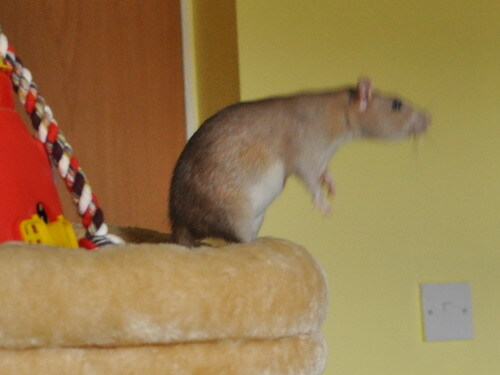 She is also an expert at quietly sneaking out of the cage given the briefest opportunity! 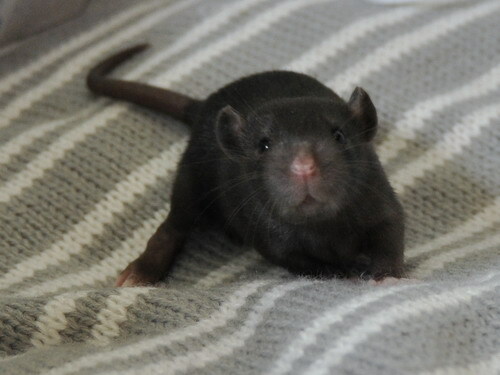 Kazoo is her cousin, a black Essex from Monkeyshines litter, and whereas Figgy has a more solemn side, he is a total clown - very licky and people-oriented, cheeky and silly. 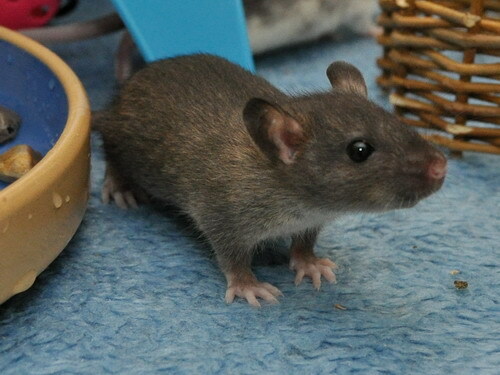 He is not yet particularly 'bucky' but has a nice solid muscly feel (and a very pretty face!). 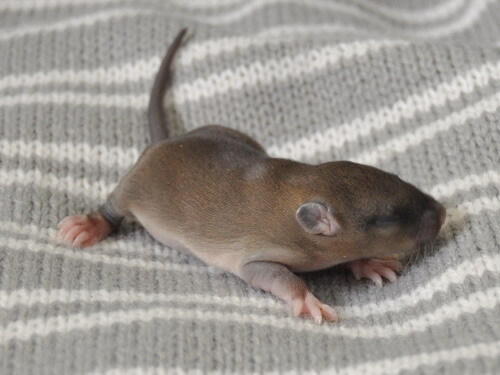 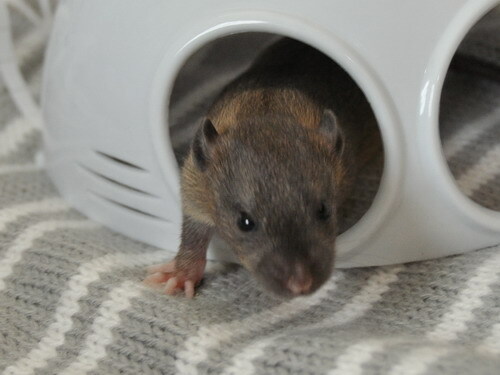 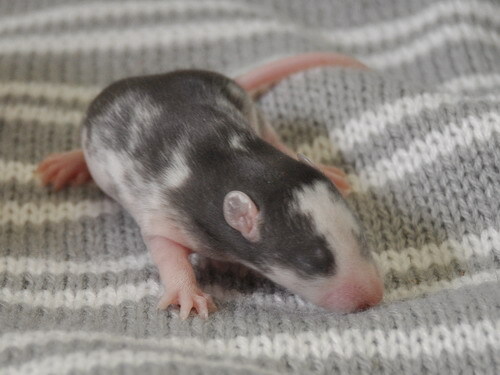 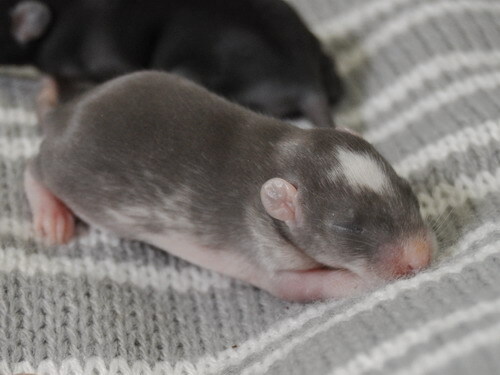 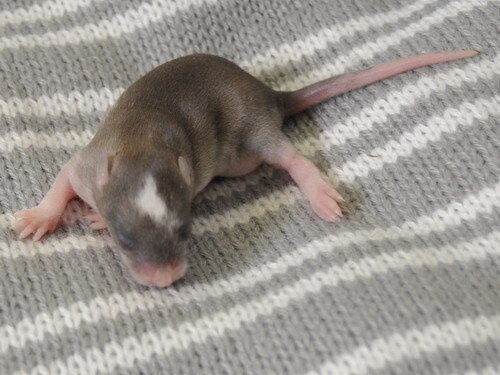 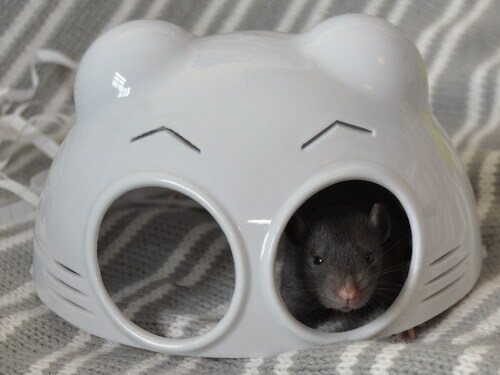 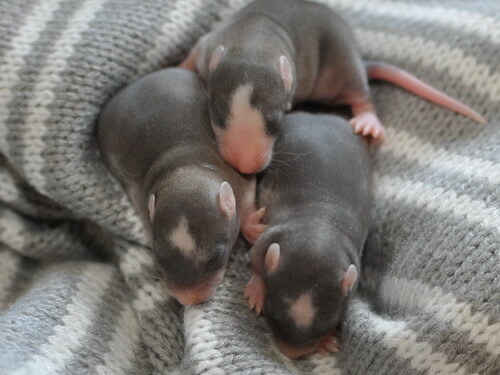 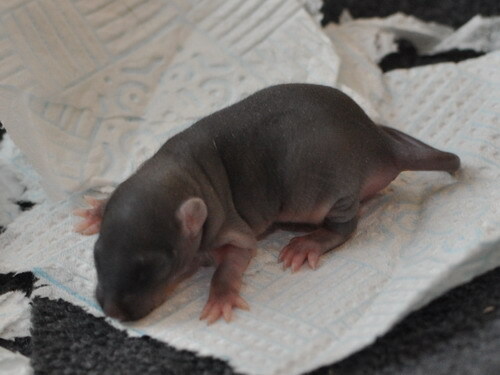 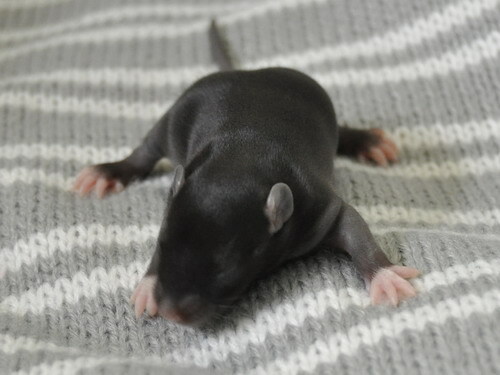 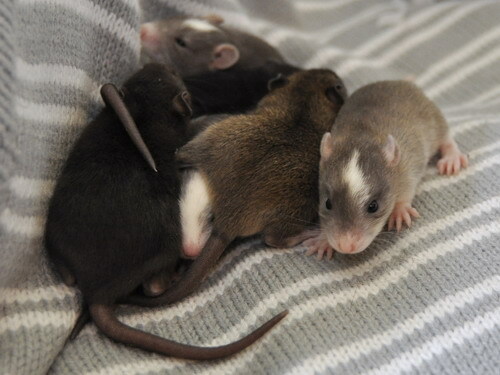 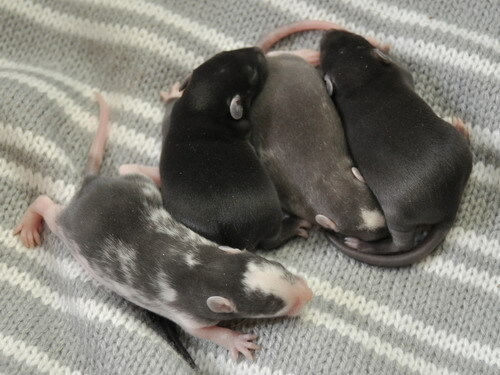 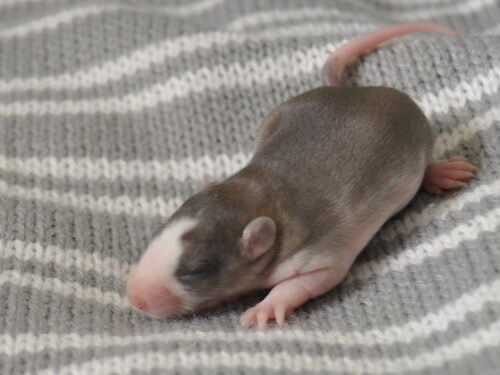 Kazoo was born here (so this is my first Lovecraft to Lovecraft litter) and lives with Jemma of Isamu Rats; we chose to use him earlier than we normally use our bucks in order to consolidate the two TI outcross litters from last year. 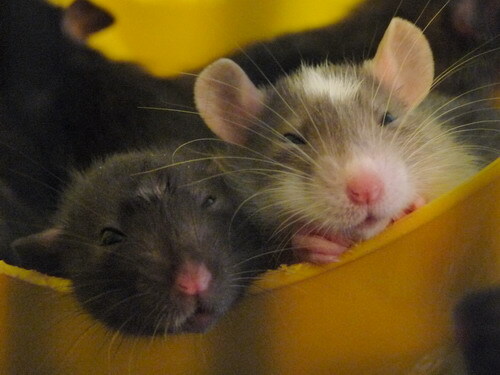 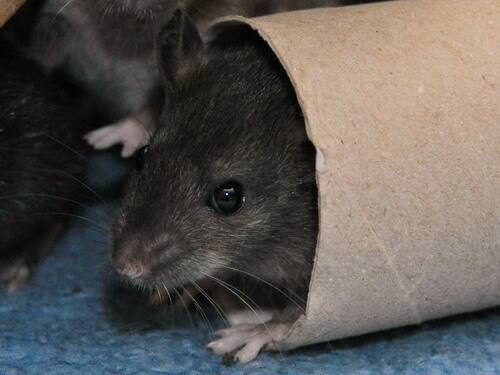 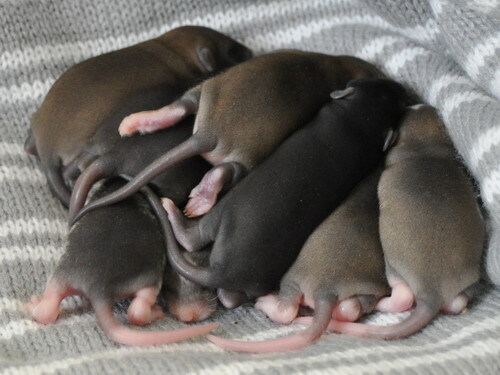 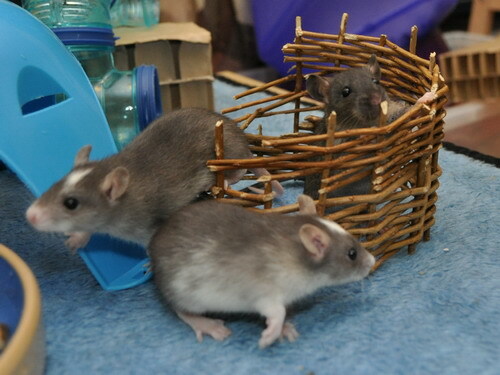 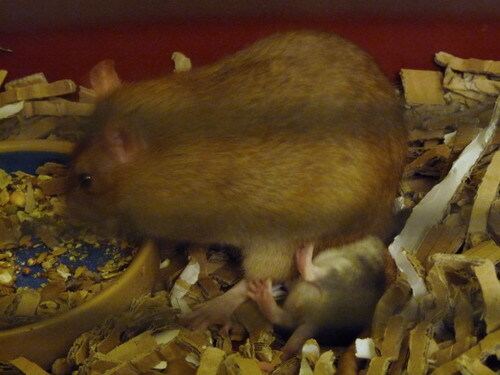 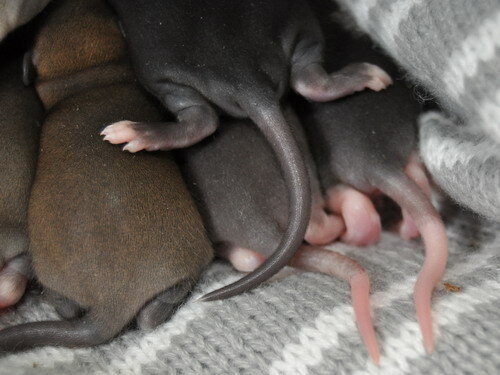 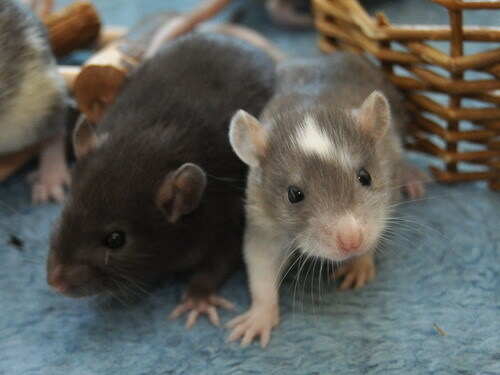 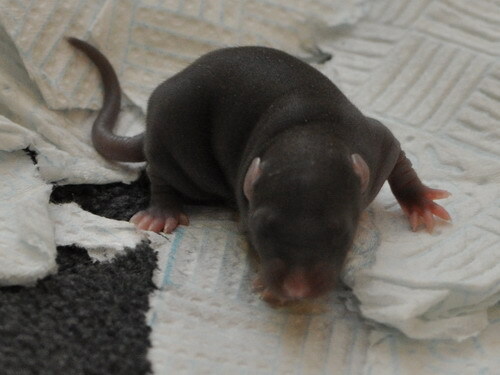 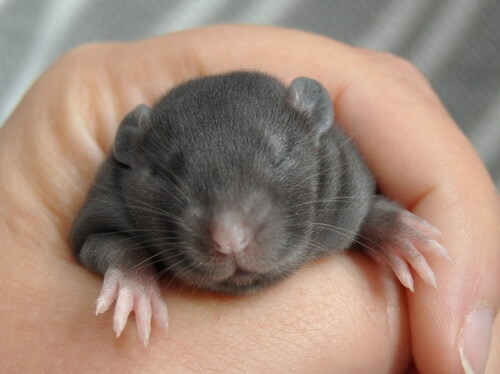 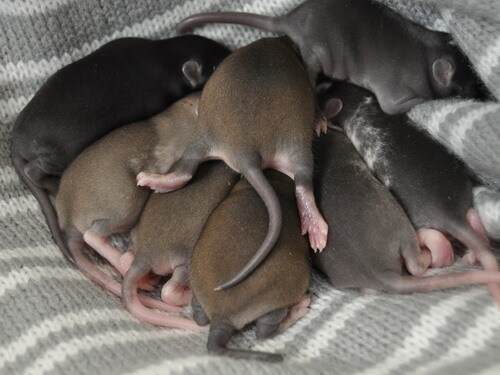 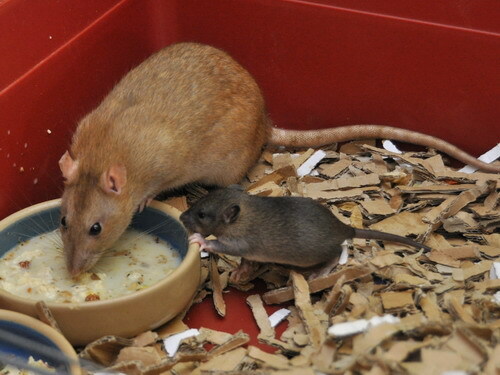 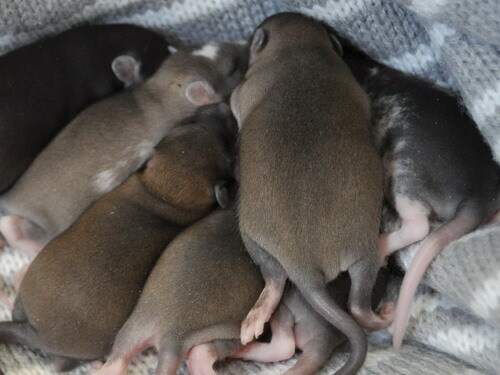 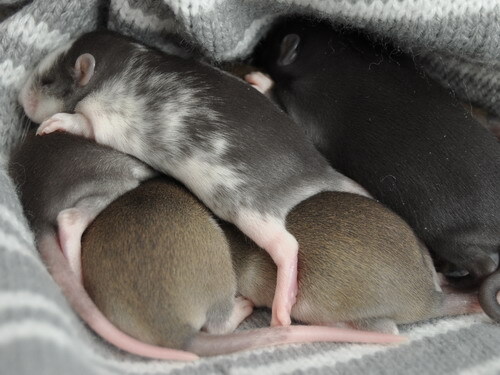 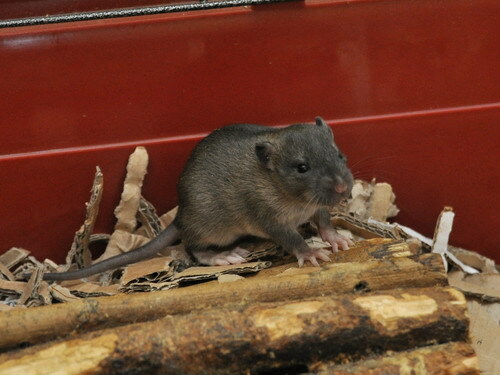 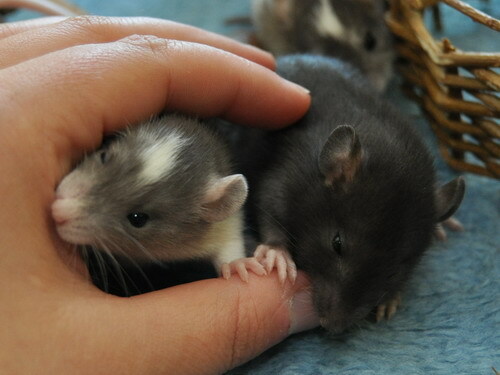 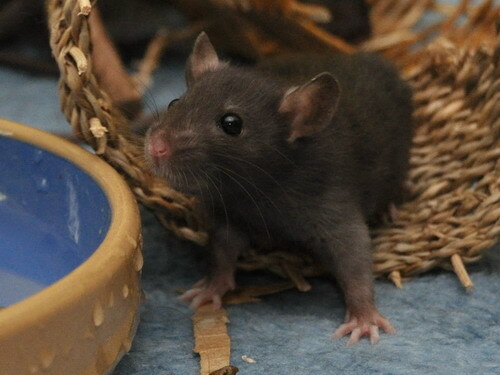 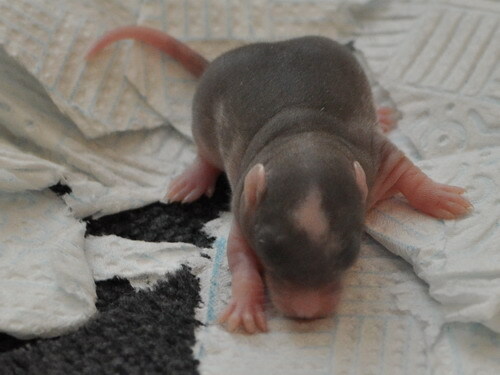 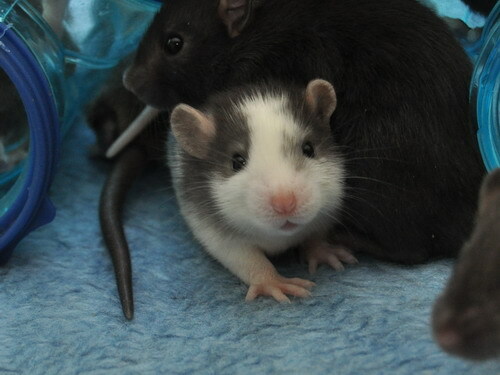 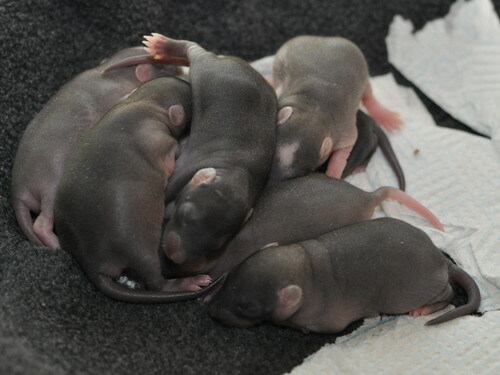 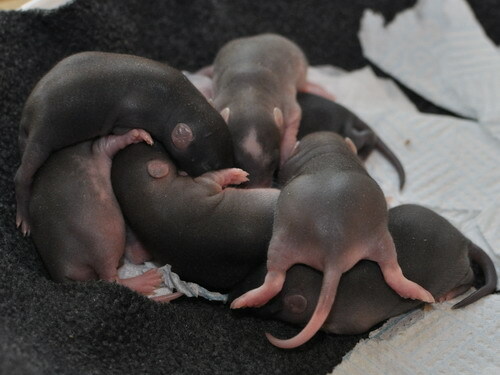 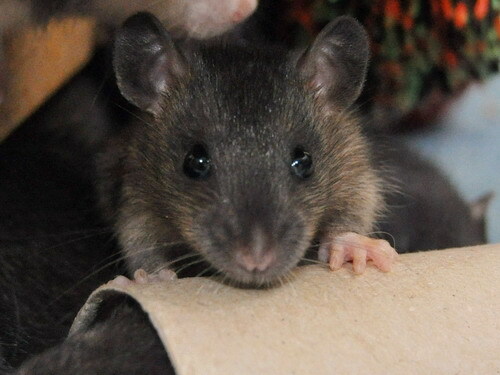 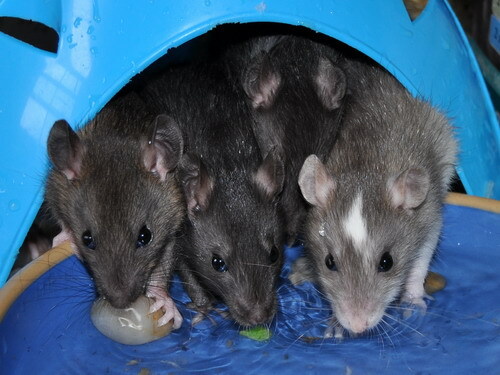 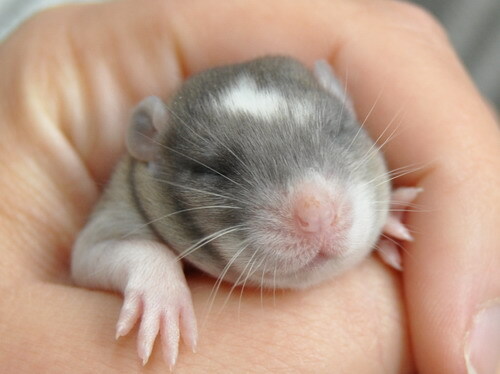 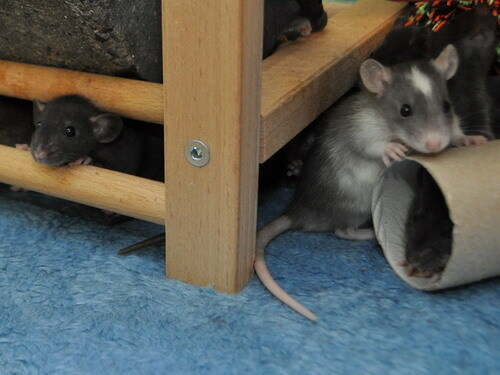 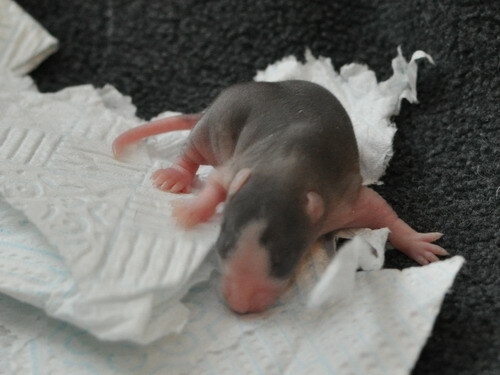 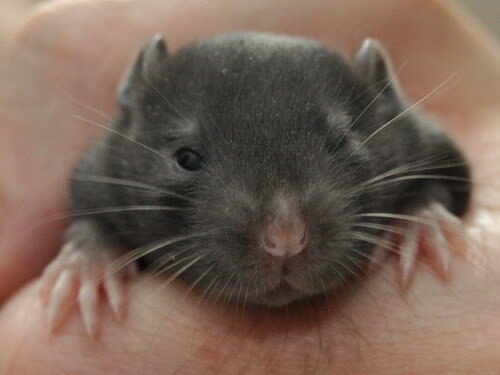 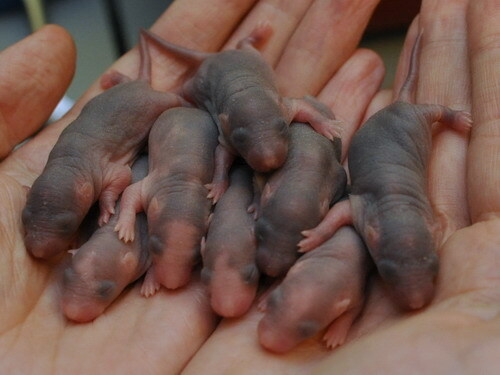 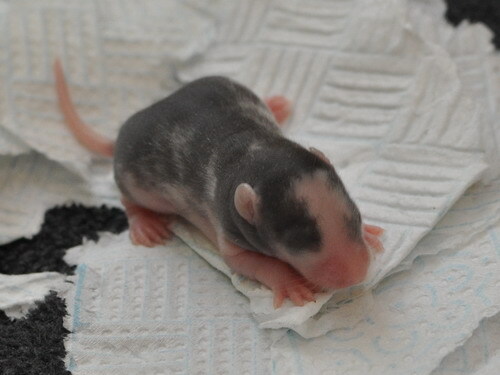 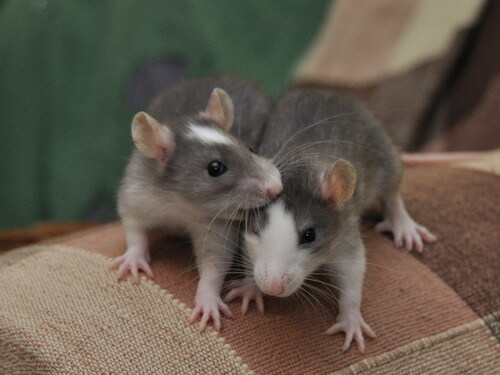 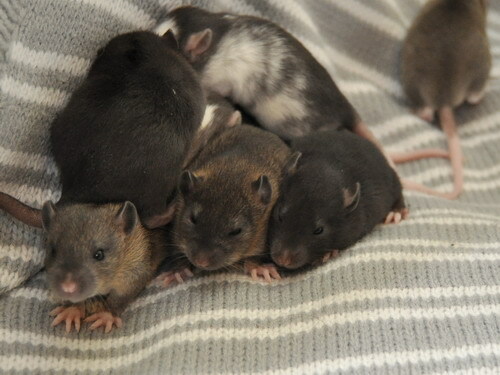 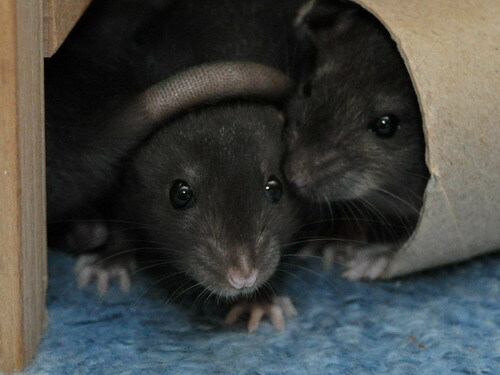 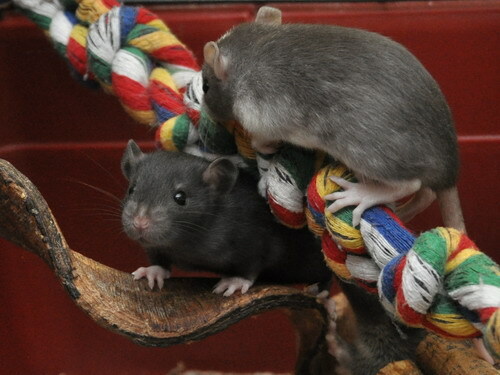 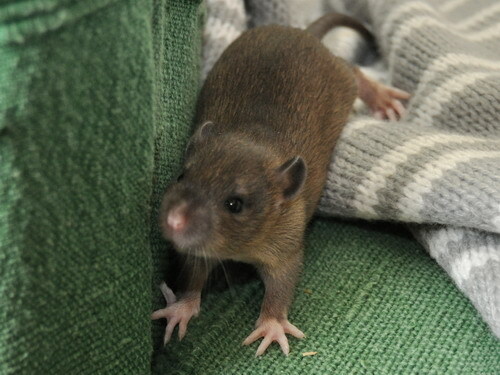 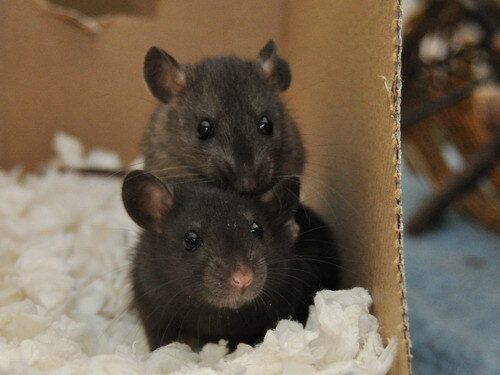 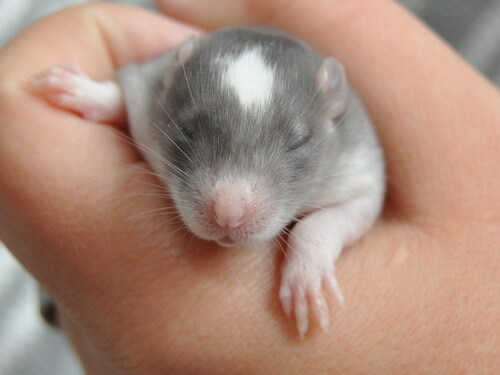 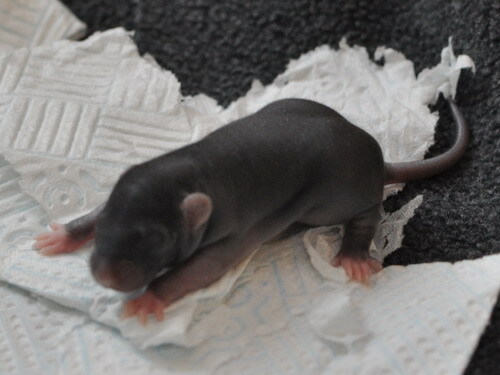 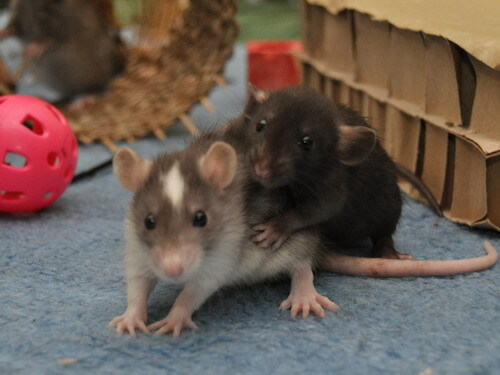 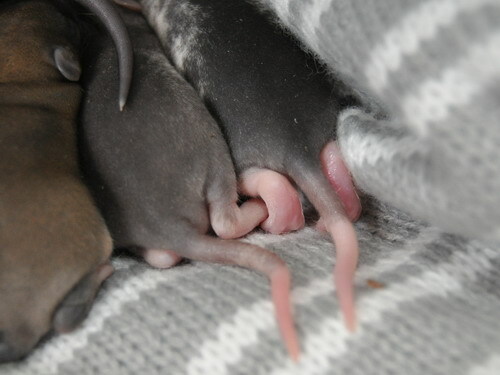 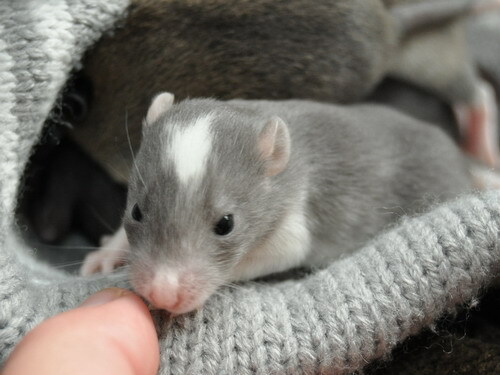 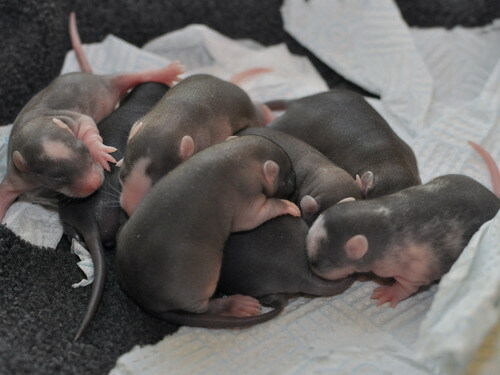 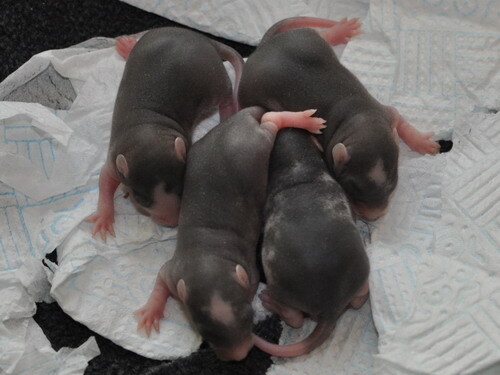 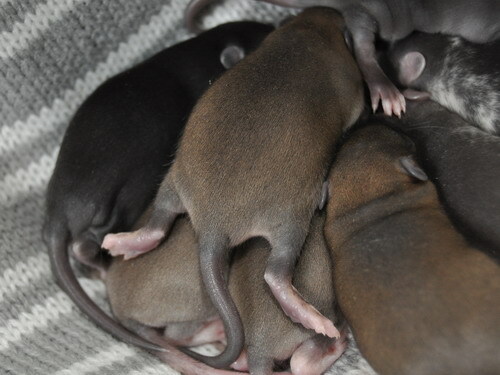 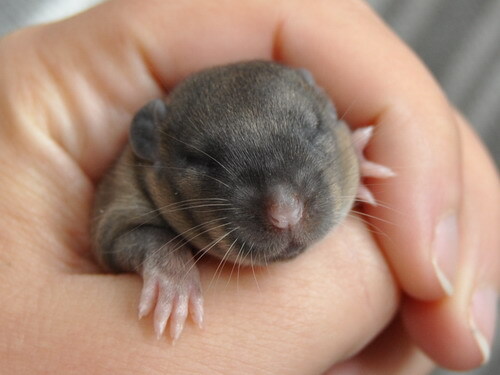 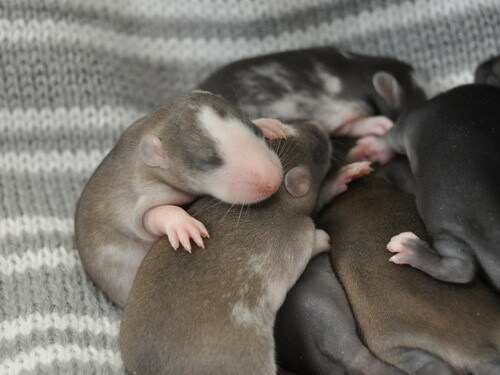 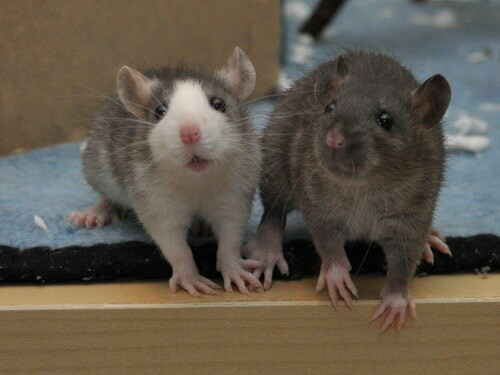 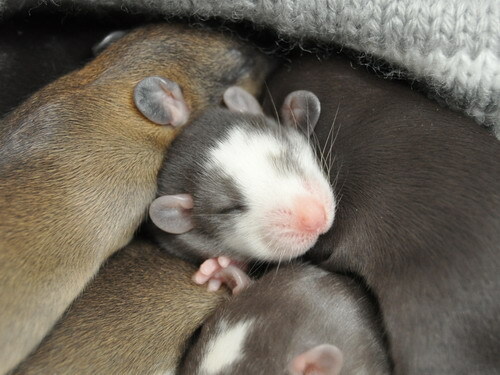 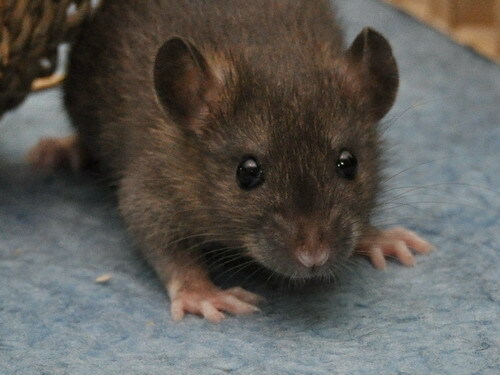 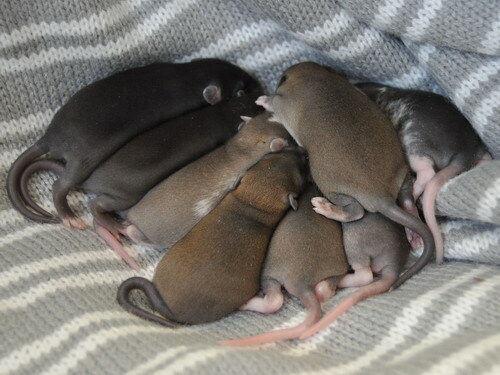 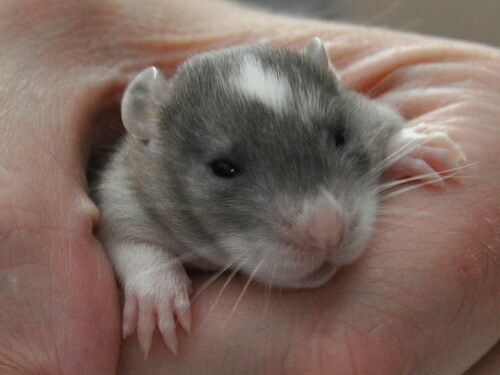 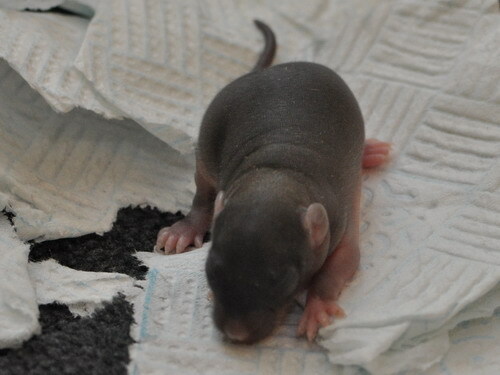 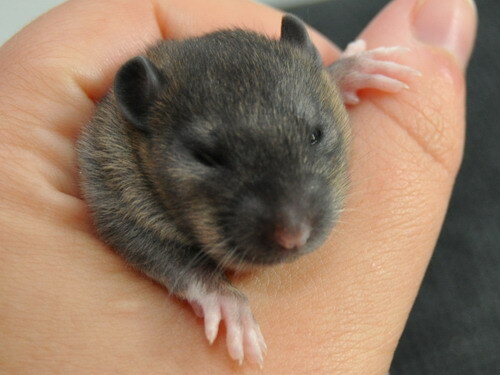 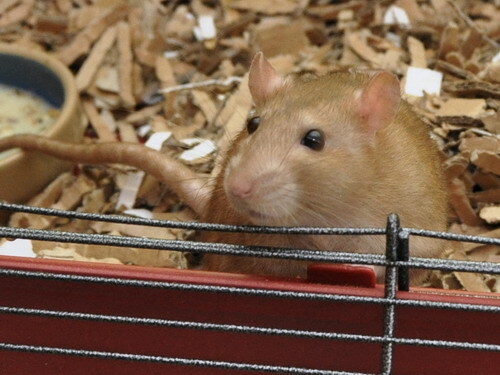 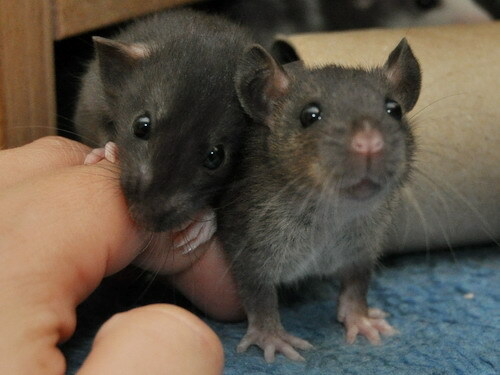 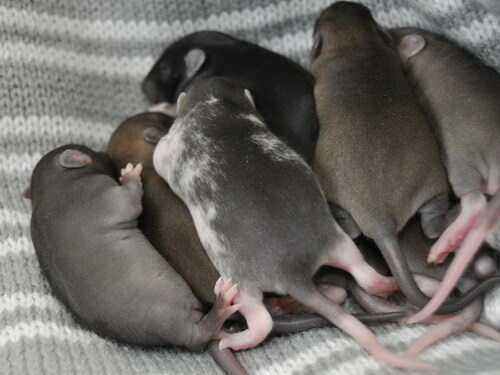 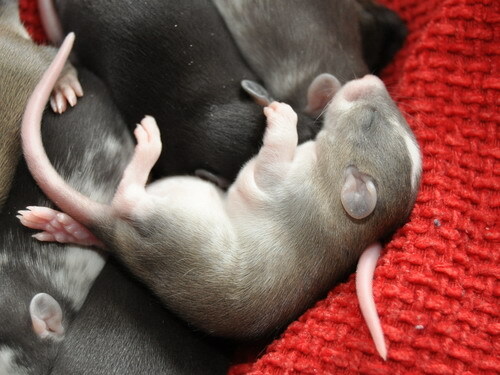 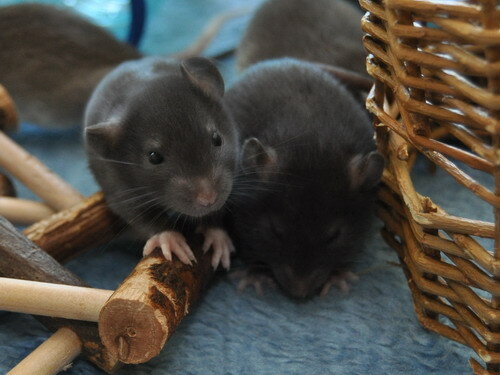 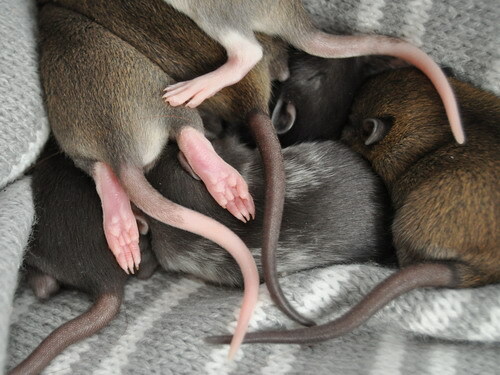 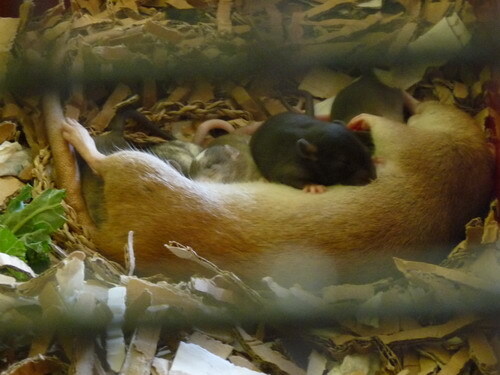 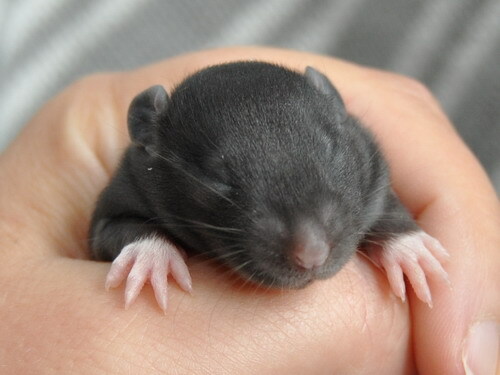 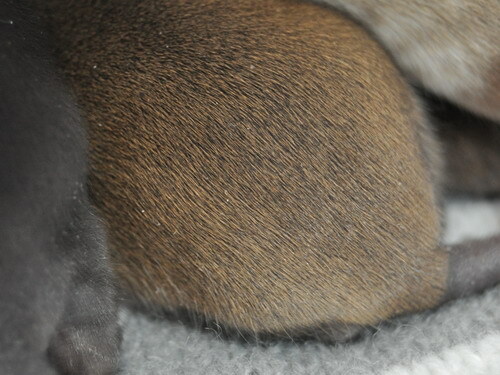 We're hoping for happy, friendly little clown babies in agouti and black, Essex and unmarked. 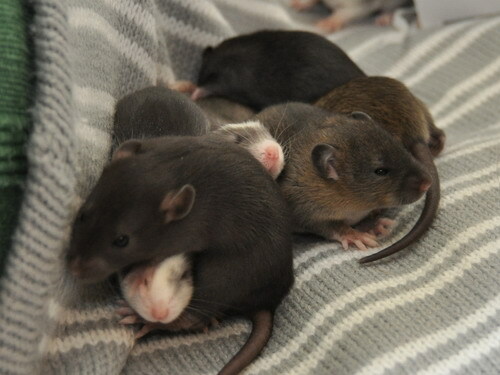 There is a chance of Russian, and in terms of recessives, some babies will carry mink and/or RED. 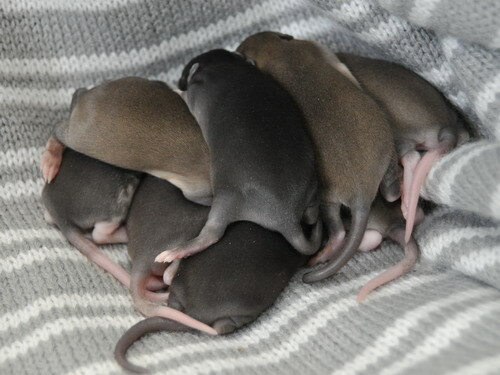 This litter will be homed jointly with the Catches.